Cat skin diseases have many causes. The first step in diagnosing and treating cat skin diseases is for your veterinarian to examine the cat and classify the skin problem. Just like people, cats can have rashes, lesions, and cysts, to name just a few cat skin problems. Symptoms of cat skin diseases include a dry, dull coat; loss of hair; irritated, red skin; flaky dry skin; bumps or lumps; scabs or scaly patches; excessive scratching. Warts in cats are not a cause for concern. Cysts are fluid filled lumps under your cat’s skin. They are usually benign. The veterinarian can drain the cyst if it is making your cat uncomfortable. Cat skin lesions need to be taken seriously. A skin lesion could develop if your cat has been scratching or gotten injured and an infection has developed at the site. The veterinarian will determine if this is an infection or do a biopsy to determine whether or not cat skin cancer is the problem. 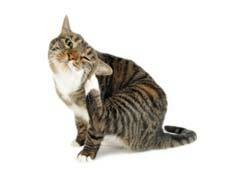 In cases of cat itchy skin, the problem could be caused by fleas, mites, ticks, diabetes, or allergies. Ringworm causes round, raised spots on the cat’s skin. Ringworm is not a parasite. Ringworm is a highly contagious fungus that affects the skin. Since cat skin diseases can have so many different causes, it is wise to consult your veterinarian. As part of the diagnostic process, the veterinarian will examine the skin and my use a special light to check for fungal infections. A biopsy may be performed. During a biopsy, cells are removed from a lump using a needle. The sample is sent to a pathologist to determine if the lump is cancerous or benign. Blood tests can screen your cat for infections or nutritional deficiencies. Cat health insurance is helpful in defraying the cost of the various tests used in the diagnostic process.